6711181: 14-15 Chevy Silverado1500 (All Models). X METAL Custom Black Mesh Chrome Studded Grille w/Cross Bars (Replacement.) T-Rex Grilles is the leader in cutting edge custom grille designs and has done it again with the new X METAL Series Grilles. Starting with top quality steel, T-Rex Grilles assembles a proprietary formed wire mesh into a precision laser cut frame surround. The entire grille is powder coated black for a tough and durable semi gloss black finish. Attractive chrome studs are added to give it that unique custom look that says: "there is no other truck like this in my neighborhood!" Set yourself apart with the latest in high quality custom grilles from T Rex Grilles. Comes complete with hardware and instructions. Completely replaces factory OE grille. X Metal badge may be removed. Installation time is about 1/2hr. Backed by manufacturers limited lifetime warranty. Made in USA. 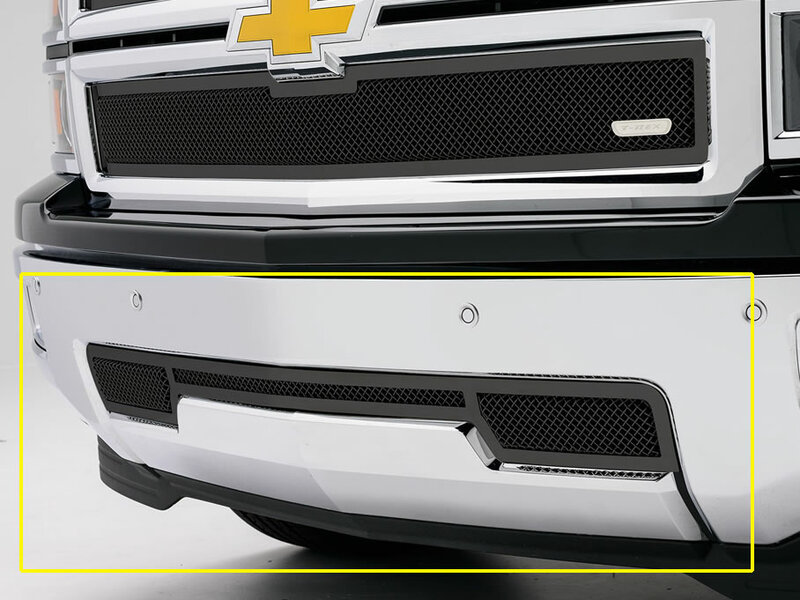 Bumper mesh grille is also available above as an optional item. Tell your friends about the X METAL Custom Black Mesh Chrome Studded Grille w/Cross Bars. Share this product on Facebook, Twitter, MySpace or send an email to a friend!